They’ve been on the market for quite some time now, but facial cleansing brushes are still trending in the world of skincare (and for a good reason). When it comes to exfoliating, polishing and improving your complexion, there’s just no competition. 1. Offers a deeper and more thorough cleanse than just using your fingers or a washcloth. The bristles penetrate further into the surface of your skin, getting rid of more dirt, debris, and oil. 2. Your skin renews itself every 28 days and exfoliation from a cleansing brush speeds up this process. 3. Exfoliation tightens skin, shrinking the appearance of pores over time. 4. Using a facial brush stimulates the surface of your skin, making it more radiant and smooth. 5. Your lymphatic system collects cellular waste and delivers it to your blood for elimination. Facial brushes stimulate this process and help your skin “detox”. 6. You’ll be prepped for the rest of your skincare routine. Your serum and moisturizer, for example, will be easily absorbed so you’ll see better results. Don’t forget to always follow up with SPF. Despite these amazing benefits, there’s a lot of misinformation and confusion about these must-have skincare tools. So, let’s start by debunking 12 of the most common misconceptions about them. It’s all about knowing your skin type, prepping it for cleansing and using the brush the right way. Whether you prefer a makeup remover wipe, micellar water or an oil cleanser, remove your makeup before using a cleansing brush. It can’t completely remove makeup by itself. In fact, it can actually push makeup deeper into pores, causing breakouts. Use plenty of cleanser and water on the brush head to avoid irritation. 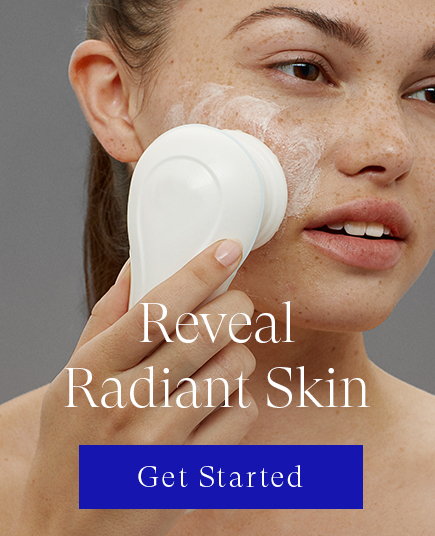 It’s normal to experience an acne flare-up after using a cleansing brush for the first time. This is called the “adjustment period”, “transient acne” or “skin purging”. Generally, your cheeks, temples, and chin are the most prone to breakouts. The reason for this is that your skin is shedding dead skin cells at a faster rate than normal and all the underlying bacteria are coming to the surface in the form of pimples. You should see an improvement within 2-3 weeks. Just stick with your usual routine and your skin will begin to look better than ever. If it continues or gets worse (like redness, dryness sensitivity), it’s okay to take a break until your skin calms down and goes back to normal. After you’ve given it some time, slowly reintroduce the brush again (once a week is good). That’s not necessarily true. You just need to use caution and make sure you don’t go overboard. Stick with a cleanser that you already know your skin can handle. Use the brush 1-2 times a week and think of it as a treatment for your face. Make sure to use a light hand and don’t use it on your face for too long. Finer, thinner bristles, like a silicone brush head, will be gentler on your skin and won’t be so abrasive. This will only happen if you don’t cleanse your brush head properly (which you should do after every use). Rinse it under warm water and use an unscented liquid soap to remove dirt and makeup residue. Then, massage the bristles clockwise with your clean fingers for 1 minute, switch to counterclockwise and repeat. This prevents breakout-causing bacteria from building up. Once a week, soak the brush head in a bowl of rubbing alcohol for 1 minute (and don’t rinse). This will kill any remaining bacteria. Make sure to always let your brush head air-dry on a clean towel in a well-ventilated room. To remove residue or buildup on the handle, clean it at least once a week by removing the head attachment and wiping it thoroughly with a damp, soapy towel. For the best results, replace your brush head every 3 months and never share it with other people. Too much exfoliation can lead to red, irritated, dry skin that feels scratchy or tight. No matter your skin type, start off slow (1-2 times a week) to see how your skin reacts. Then you can slowly work up to the usage that’s right for you. Dry and sensitive skin types should stick to 1-2 times a week, while oily skin types can work up to once a day. You might even consider getting a two-speed brush so you can start on the lower speed and work up to the second speed gradually. No matter the brush, avoid the delicate eye areas. While cleansing brushes can get pricey, there are plenty of affordable options out there (like ours). Think of it as a long-term investment for your skin--it’s worth the cost. Consider that you might spend as much (or more) visiting your dermatologist, esthetician, going to a spa or fixing a skin problem that could’ve been prevented. Using a cleansing brush is a proactive approach to skin care. Cleansing brushes can actually help treat acne by helping to eliminate excess sebum, which contributes to acne breakouts. You just have to pick the right one and the right cleanser to go with it. Anything that’s too harsh can exacerbate acne. Try slowly working up to using the brush 2-4 times a week and pay attention to whether pimples become aggravated. If they do, scale back or take a break. Note: Use caution around cystic acne, which occurs deep below the skin and is often painful. Brushing can irritate the cysts, leading to more irritation and allow more bacteria to enter the pores. There are plenty of brands that have their claim to fame or declare their cleansing brush the “best”. But, not all brushes are created equal. Find one that’s right for your skin’s specific needs and your lifestyle (i.e. rechargeable vs. battery powered). First, quality varies and this is reflected in the pricing. And, some--including ours--are cruelty-free. Second, different cleansing brushes serve different purposes. For example, some increase collagen production to target fine lines and wrinkles, while others aim to diminish the appearance of pores. There are even waterproof ones available. Third, brush heads are unique. Some come in kits and for some brushes, you have to buy them separately. They also can be interchangeable. Also, they can spin in different directions (i.e. clockwise/counterclockwise). For example, some rotate, some pulse and some oscillate a certain number of times per second. They usually come with multiple speeds. Brush heads are made out of different materials, like nylon, latex or silicone. They can be natural or synthetic. And, depending on their purpose, some are finer and others are more thick and coarse. Choosing a gentle cleanser that works well with your skin will give you the best results. A cream, foaming or gel formula will work best with the cleansing brush. Don’t use a physical or chemical exfoliant when using a cleansing brush (i.e. a scrub with little beads or nuts, or a cleanser with glycolic acid). That’ll provide too much exfoliation and can cause a range of other problems (like breaking down skin tissue). We recommend our Main Squeeze Daily Cream Cleanser. It goes on like a cream and begins to lightly foam when wet, giving you a gentle (and therapeutic) cleansing experience. There’s no arguing, cleansing brushes have become a staple in many skincare routines because they deliver noticeable, positive results. Your skin is the largest organ on your body and it needs to be cared for. And, when you consider you can get professional results without having to go to a dermatologist or esthetician, it’s hard to see a downside. They’re also portable and extremely efficient, surpassing most other cleansing methods. Even better? They come in different colors and sizes, depending on your preference. They may look intimidating, but they’re actually fairly easy to use. In fact, they are far less work than traditional methods like your hands or a washcloth. Before buying one, it helps to do research and read reviews online. It’s never a bad idea to ask your dermatologist or esthetician for their recommendations and advice. Just make sure you read the instructions carefully and don’t be afraid to reach out to the company if you have any questions. Some of the best advice? Make sure you’re not pushing the brush down on your skin too hard. Wet your face and brush first and apply a nickel-sized amount of cleanser to the side of the brush (not the center). Let the bristles glide across your skin and use gentle, circular motions. As a general rule of thumb, cleanse your forehead, nose, and chin for 20 seconds each and cleanse your cheeks for 10 seconds each. Don’t do more than 1 minute. You’ll get the hang of it after a few uses. The only thing you have to remember is to charge it or replace the batteries and change out the brush head. This is far from the truth. For example, a person with acne-prone skin has different needs than a person with dry skin. Your skin type will determine what kind of cleanser and brush head to use and how often you should use it. Normal and oily skin types can eventually work up to using the brush once a day, while dry and sensitive skin types should stick to 1-2 times a week. In the end, you know what’s best for you. This is strongly not recommended. If you use the same brush head on your body as on your face, you’re transferring bacteria and dead skin cells. This increases your chances of a breakout. Not to mention, the skin on your face is thinner and more delicate than the skin on your body. So, body cleansing brushes are designed differently. The bristles are firmer and cover more area. They can also be too harsh for your skin and can cause redness and irritation. Cleansing brushes are some of the best tools for anyone’s skincare routine. Don’t be intimidated by them. Just remember to do your research and ask questions. With time and effort, you’ll notice a visible change in how your skin looks and feels. If you’re looking for a cleansing brush that’s right for you, check out our best-selling facial brush and get a secret discount.